All eyes were on the 2018 NATO summit in Belgium in the first half of July, as U.S. President Donald Trump was expected to lambaste NATO members’ inability to meet their commitment to spend two percent of gross domestic product (GDP) on military matters. Taking a swing at Germany, he was quick to attack the controversial Nord Stream 2 (NS2) gas pipeline, an $11 billion mega-project aimed at delivering Russian gas to German shores. President Trump alleged that the US pays disproportionately for Europe’s security and protects it from Russia, while Berlin dishes out billions of euros to Russia for energy. The grounds for President Trump’s criticism may be debated, but he has a point: NS2 should not be built because it will sever long-standing ties between NATO allies, many of whom are also members of the European Union (EU). NS2 is the expansion of Nord Stream, a natural gas pipeline that can deliver up to 55 billion cubic meters per year of natural gas from Vyborg, Russia, through the Baltic Sea to Greifswald, Germany, which has been operating since 2012. The initial pipeline was mainly spurred by Gazprom’s ambition to establish a direct link to its largest buyer, Germany, while Berlin looked to enhance its energy security. The project was moved forward as tension between Russia and Ukraine escalated over gas prices. This culminated in Russia’s cutting gas transmissions through Ukraine to Europe in the winters of 2006 and 2009. The latter left millions of Europeans in the cold. 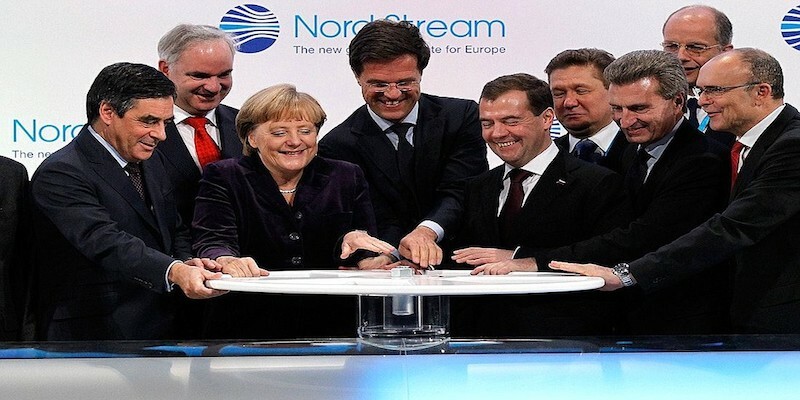 Russian tactics put security of energy supply back on the EU’s agenda and ultimately led to the completion of Nord Stream in 2012. NS2 would double transit capacities through the Baltic Sea, re-routing most of the gas currently delivered to Europe through Ukraine and Central and Eastern Europe (CEE) by 2019, although delays now seem likely. German interests find the project alluring, because a shorter route can decrease transit fees and thus decrease gas prices for end-consumers. Geo-economically, it would increase Germany’s role as a gas hub, enhance German supply security, and further German-Russian rapprochement. However, in doing so, it would significantly undermine the unity of the EU and NATO. NS2 may enhance Germany’s security of energy supply, but it would decrease this in most countries to its east. Germany is the political heavyweight in the region; Berlin’s move would significantly decrease the CEE region’s leverage vis-à-vis Russia. Germany’s Chancellor Angela Merkel may be looking for guaranteed supplies through Ukraine to sustain the region, but these are likely to be minuscule: approximately 10-30 billion cubic meters per year, compared to delivered volumes of 93 billion cubic meters in 2017. Terms would likely become less favourable for buyers in the affected regions; Moscow could also become more prone to weaponize gas, with less push-back from its main regional counterweight. Kyiv has managed to rearrange its gas consumption portfolio, essentially eliminating imports from Russia. Yet it still relies on its Western counterparts reselling flows from Russia. As for CEE gas purchases, these may be shifted to sources from the north and west, although for the time being, the EU’s gas-market interconnections do not fully permit that. Many projects in-progress can boost the region’s supply, including various gas interconnectors within and to Central Europe, the Bulgaria-Romania-Hungary-Austria BRUA pipeline, the Southern Gas Corridor including the Trans-Caspian Gas PipelineTCGP and Trans-Anatolian/Trans-Adriatic network TANAP-TAP projects, and the Baltic Pipeline. However, these will be only gradually completed in the upcoming years. Gas markets may be able to resolve the issues arising from NS2’s curbing Ukrainian transit, if this occurs, but only towards the beginning of the next decade. The EU and neighbouring members of the Energy Community are moving towards an integrated gas market that allows market mechanisms to distribute resources efficiently, but its members still rely heavily on cooperation in times of crisis. The Energy Community’s reliance on imports to satisfy demand for gas means that in case of shortages, member-states would have to convey solidarityand share available resources amongst themselves. Such an approach has had mixed results. It worked at the height of the 2009 gas crisis, when Gazprom cut off flows through Ukraine. Serbia, a member of the Energy Community but not of the EU, was amongst the most severely hit countries; however, with Berlin’s approval, the German company E.ON was able to find German gas to send there. By contrast, Austria was quick to cut gas flows to Italy and Slovenia after the 2017 explosion at its important Baumgarten gas hub. Many scenarios for future gas transits have been drafted, assuming NS2 is constructed, but such technical assessments divert attention from the damage that Berlin inflicts by further disrupting European unity. It would represent a severe breach of trust for Germany to abandon its allies in this way; it would empower Moscow in the region. The Kremlin would be unlikely to hesitate to expand its political influence in the region, as it has already done through Italy and Hungary, amongst others. Constructing NS2 could re-establish and even push the old Cold-War front line between East and West further to the west. Washington has every good reason to be concerned over NS2. The disunity it has already spurred, without even being implemented, would have ripple effects on the EU and NATO projects, which have kept Europe at peace for seven decades. The United States has so far only opposed NS2 in words. But with Germany risking increasing divisions in an already divided EU, the U.S. Administration and Congress should not hesitate to sanction firms involved in the pipeline to halt its construction. This would be a radical action. It would certainly entail diplomatic rifts amongst Washington, Berlin, and Moscow; however, it may the wake-up call that Germany needs. Photo: Launch ceremony for the Nord Stream gas pipeline (2011), by the Russian Government via the website of the President of Russia. Public Domain.